Pipelines and canals buy some cities a ticket out of water stress — for now. 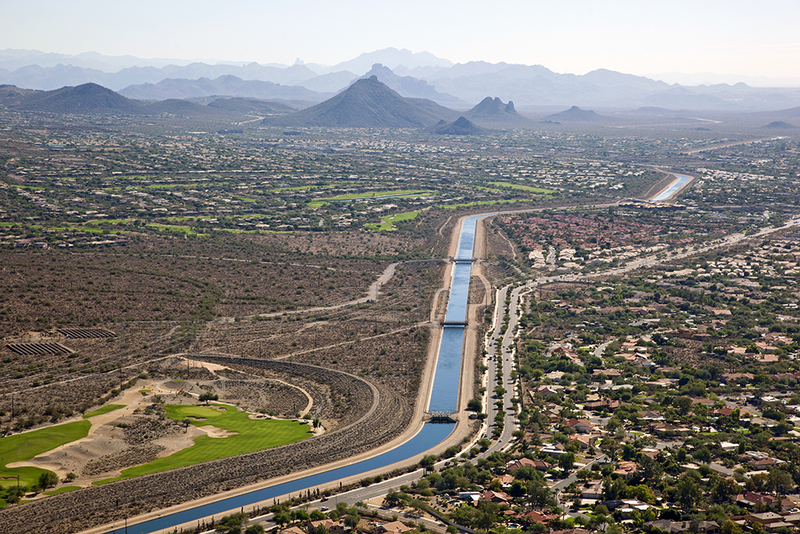 The Central Arizona Project moves water 540 kilometers (336 miles) from the Colorado River to cities in the desert heart of Arizona. Click image to enlarge. For water, as for the rest of life, money is the great insulator. A new study on urban water stress reveals that fewer of the world’s large cities than previously thought are approaching severe limits on their drinking water resources – just 25 percent of cities with a population greater than 750,000, not 40 percent as had been claimed. Why the lower number? Because the expensive canals and pipelines that draw water from distant basins were not accounted for in earlier assessments, which assumed, for example, that the only water Los Angeles was using came from the local rivers and aquifers west of the San Gabriel Mountains. Massive water diversions allow cities to flourish in areas in which current lifestyles would otherwise be impossible. Los Angeles, in fact, pulls more water from outside its natural watershed than any city in the world, according to the study, which was published online this week in the journal Global Environmental Change. A wealthy city benefiting from investments fought over and built more than a century ago has that advantage. Many poorer urban areas today do not, said Rob McDonald, senior scientist at the Nature Conservancy and the study’s lead author. In such cases the power of international lenders could be called on, said McDonald, who cited Sana, the perilously dry capital of Yemen, as an example where outside money would help. Three figures show that pipelines and canals allow cities to circumvent local water scarcity. Figure A shows western U.S. cities (in red) and their water sources (in blue). Figure B shows that 40 percent of the world’s large cities are water-stressed when considering supplies available locally, but only 25 percent when existing pipelines and canals are added to the equation. Figure C shows the location of water stressed cities (in red) and whether they rely on groundwater or surface water. The size of the circle represents a city’s population. Click image to enlarge. Even if money is not a problem, geography might be. Most cities in the study have an unstressed water source close by. Roughly 80 percent of cities could find a source to supply 1 billion liters per day, enough for several million people, within 22 kilometers, according to the analysis. But 10 percent of cities would need to build a canal at least 48 kilometers to access such a source. 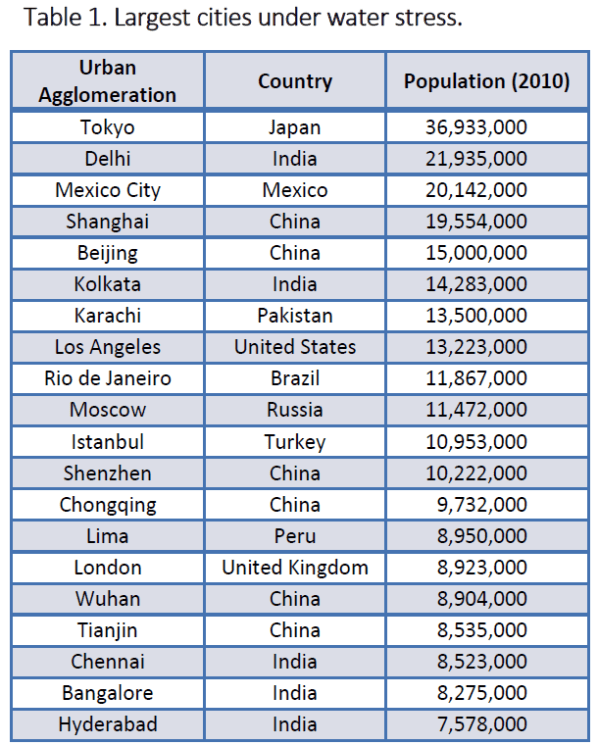 Most of these geographically limited cities are in poor or developing countries, notably China, Mexico, and in Central Asia. The ability to assess water supply challenges at this level of detail was possible because of a groundbreaking data set the research team assembled. Researchers pieced together the individual rivers and aquifers that supply more than 500 cities worldwide and identified, as best as possible, the location at which water was drawn. The largest cities classified as water-stressed. Click image to enlarge. Environmental flows, or what is needed to maintain a healthy aquatic ecosystem, were not taken into account. If they were, less water would be available for humans and more cities would be classified as stressed, bumping up the total to perhaps 29 percent of cities, according to the study. A city judged to be water stressed, however, is not necessarily a city in immediate crisis. Stressed means that cities face certain challenges, some that are chronic and others that are acute, McDonald explained. Using the City Water Map data set, researchers were able to estimate for the first time the scope of urban water infrastructure. “It’s really big,” McDonald said, clearly impressed and surprised by the numbers. Cities cover just 1 percent of the world’s land mass, but their water supplies come from watersheds that account for 41 percent of the terrestrial Earth. Urban areas get four out of every five gallons of water from rivers, lakes, and streams. Most of the rest comes from aquifers. Desalination accounts for just 2 percent of supplies. That water is moved through 27,000 kilometers of canals and pipelines, a distance equal to half the globe. This does not count the pipes within a city, from the treatment plant to the home. The water stressed cities contribute $US 4.8 trillion in annual economic production. A city, for instance, that withdraws water from its aquifer at an unsustainable rate might see its energy costs increase in the short term as water is pumped from deeper depths. But such pumping could go on for years before a noticeable dip in the water supply if the amount of water stored underground is large enough. The fresh look at water stress is the first in a series of research projects that will use the City Water Map database to assess urban water supply challenges, McDonald said. One study will use the latest climate models to map how changes in river flows brought by global warming will influence urban water stress. Another study will consider how upstream changes in farming or forestry will affect water quality and alter the cost of water treatment. A third will examine the relationship between cities and agriculture and pinpoint where shifts in farm practices might free up more water for urban use. The latter study, on agriculture-urban partnerships, is especially important. Even if some cities can afford large canals, transfers from agriculture would be cheaper, use less energy, and keep river ecosystems intact. And even though big infrastructure projects help, they are not a cure-all. System expansions eventually reach the limits of geography, cost, and conflict. After all, Los Angeles, for all its canals, is still classified as water stressed. Binayak, as with many studies it’s important to note what variables are measured. In this case, the researchers defined water stress for surface water as withdrawing more than 40 percent of average supply. For groundwater, they defined stress as withdrawing more water than soaks back into the aquifer. According to these metrics, Sao Paulo was not determined to be in water stress under normal conditions. The drought, of course, has drastically cut rainfall while authorities have been largely unwilling to reign in demand. Leaky water pipes are also a problem — much of the supply is lost between reservoir and faucet.